"Your turn. Mark! Your turn!" "What, huh, oh yeah! Sorry, miles away." I close the cover and put the newly-revealed book down, clearly I got it wrong this time. Straddling that line between interest in the present you just opened and holding everyone else up by forgetting to put it down, it's a difficult one to get right. The book in question is "The Flavour Thesaurus" by Niki Segnit and, even with attention set to flick-through, my head is swamped by ideas and inspiration. 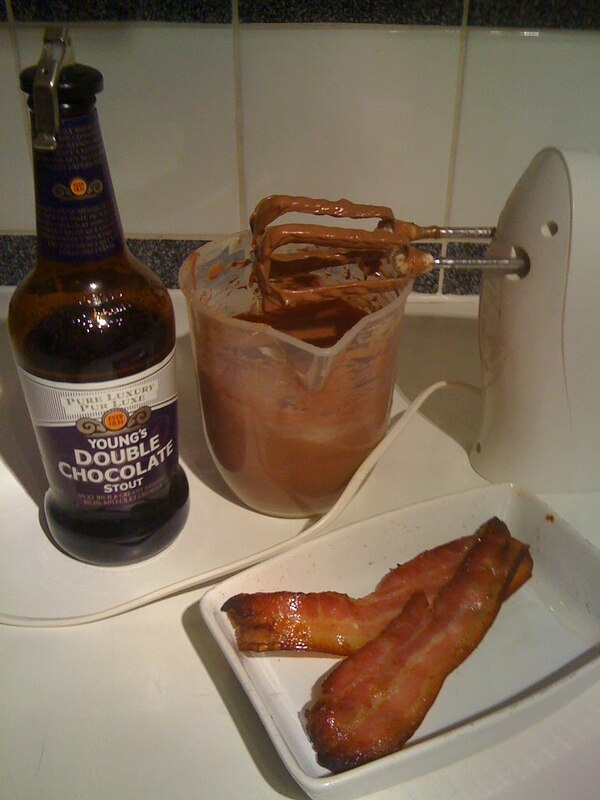 Chocolate with bacon wrestles its way to the front of the list. Like many, I tried bacon and maple syrup for the first time with considerable reservation, only to be blown away by just how incredible a combination it can be. Apply that theory to chocolate and you can understand how the two might work in partnership. A muffin strikes me as the perfect medium on which to bring these two flavours together, and it just so happens that I’ve got a tried and trusted muffin recipe in my arsenal already. I always cook bacon in the oven, laid on a cooling rack that sits in a walled baking tray. I do this for a few reasons: firstly it means the flat doesn’t smell like the local cafe for the rest of the morning, secondly because I find it allows the fat to drip away from the meat, causing it to dry out slightly and crisp up better. That and because I don’t own a grill! I cooked two rashers of smoked streaky and then diced them very finely. 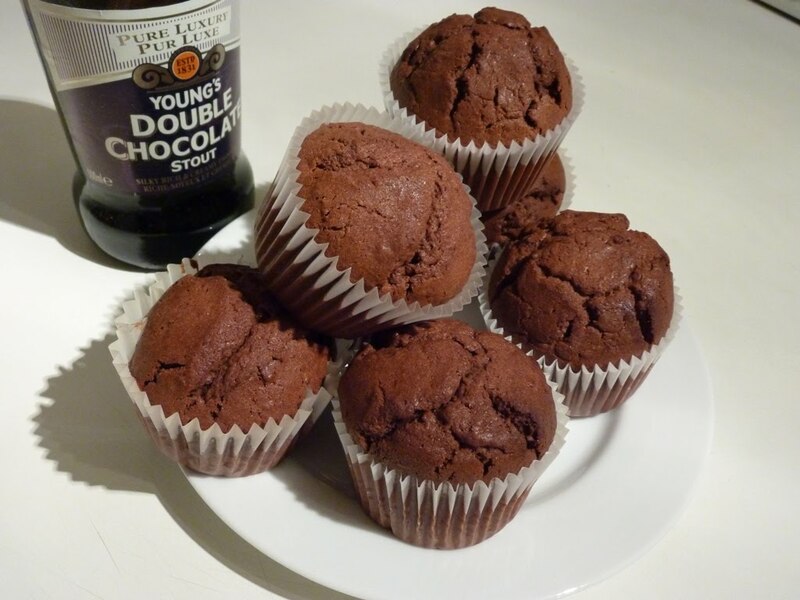 This was added to the batter right before resting, along with four heaped teaspoons of cocoa powder and two tablespoons of Young’s Double Chocolate Stout. Baked in the normal way, the muffins were then cooled and enjoyed with the rest of the beer. I like Young’s Double Chocolate Stout. It’s like a big beery chocolate bar forced into a bottle. It’s a great beer for pairing with food and it worked really well here; the thick body and chocolate notes sitting alongside the dense, sweet muffins. A palate cleansing crackle of carbonation and then a tease of bitterness. All happening whilst that salty, meaty bacon added depth to the chocolate, almost seasoning it, enhancing the chocolate flavour but taking it in a new direction at the same time. A strange combination, but one that really works. * Flickr photo set for this post. hahah - love it. Love it. I once saw a chocolate doughnut with slices of Bacon atop it in leiu of icing in the States - and we've been eating maple syrup with bacon for years, so why not this? Wonderful. A good recipe. It may sound weird but seems they match pretty well. This really goes along well over a cup of tea.